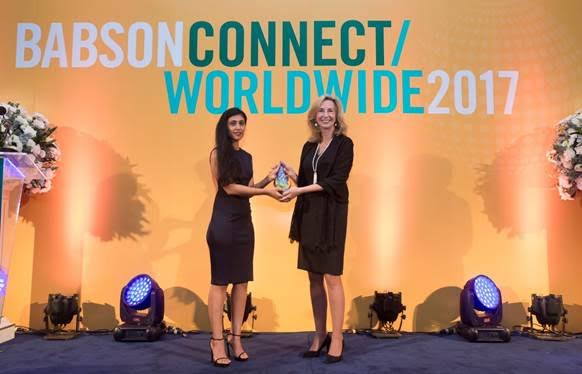 Noida, India, March 27, 2017: The Shiv Nadar Foundation today announced that Roshni Nadar Malhotra, Executive Director & CEO of $7 billion enterprise HCL Corporation and Trustee, Shiv Nadar Foundation has been felicitated with the “Lewis Institute 2017 Community Change maker” award at the 3rd Babson Connect: Worldwide (BCW) Summit in Bangkok, Thailand from March 23-25, 2017. The award recognises and celebrates an individual who has set something in motion in order to create a positive change and employs the Babson methodology of Entrepreneurial Thought & Action®. The Shiv Nadar Foundation (www.ShivNadarFoundation.org) has been established by Shiv Nadar, Founder, HCL - a $7 billion leading global technology and IT enterprise, with over 115,000 employees across 32 countries. Founded in 1976, HCL is one of India's original IT garage start-ups and offers diverse business aligned technology solutions spanning the entire hardware and software spectrum, to a focused range of industry verticals. By drawing upon Babson’s core methodology of Entrepreneurial Thought & Action®, we activate unexpected and fruitful collaborations and integrative designs for action. The result is business prosperity and societal improvement. We extend our impact through the Babson Social Innovation Lab, an action tank powered by Toyota, which incubates people and ideas in the world of the social innovation.